Biennial wormwood is not new to Wisconsin, as has been in the state over 100 years, but I have seen it spreading throughout Wisconsin for the past decade. It likes lighter soils that are heavily disturbed, but has become a large problem in agronomic fields in nearby states. While I haven’t seen it in any fields yet, I am sure it is present as many of our roadsides are lined with this species. This plant has unique attributes as it has biennial and annual biotypes. Apparently the Midwest United States predominately have the annual biotype, so don’t let the name fool you. What is most concerning about this plant is that it doesn’t start to germinate until well into June and continues to germinate through July. Thus it is often not controlled by PRE herbicides, cultivation, and even some POST treatments. Also others have reported that poor control with many of our commonly used herbicides (e.g. ALS, PPO, HPPD). As this species is clearly spreading the best option is to detect populations early and prevent them from establishing in fields. 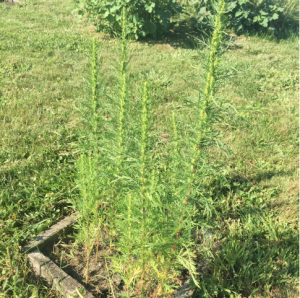 See this factsheet to learn about how to ID this “new weed” to Wisconsin.